Each room has a light and spacious exercise area and generous separate bedroom, with panoramic views across the hotel’s beautiful wildflower meadow. No wire mesh here - these rooms are constructed from uPVC and full height glazing to guarantee the highest possible standards of hygiene and security. They also exceed the CIEH guidelines for size and well-being. What else would you expect for your loved one? Our dedicated, purpose-built hotel benefits from double-entry door systems internally and CCTV monitored visitor entrances. 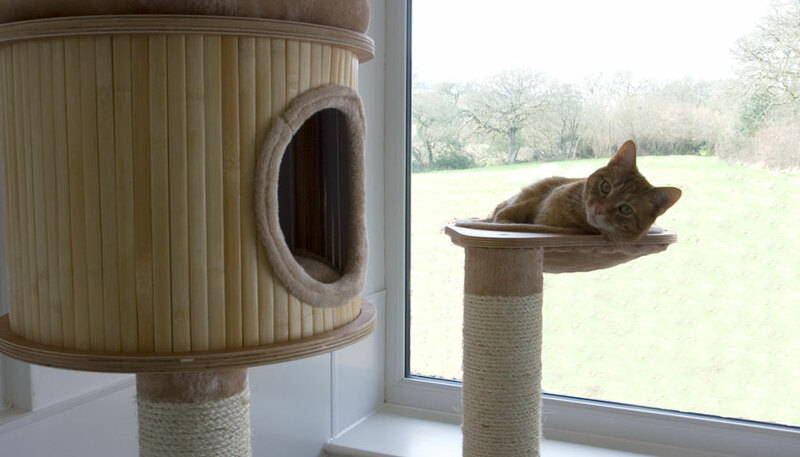 Our staff are on-site during the day and only a stone's throw away out of office hours, so you can rest assured that your cat is secure in our hands. We want your cat to feel as comfortable as possible during their stay. Each room has individual, temperature-controlled underfloor heating, as well as an advanced ventilation system that provides a constant supply of fresh meadow air. With state-of-the-art materials, elegant climbing furniture, wrought iron beds and sumptuous bedding, the rooms offer a unique luxurious experience. We give our guests the attention they truly deserve, whether it is play opportunities or simply a lap to relax on with a comforting cuddle. We provide a variety of toys for interactive play that are updated frequently to keep our guests stimulated. Bird and squirrel feeders are situated in sight of all rooms to allow the guests to watch the local wildlife from the comfort of their spacious window sill. 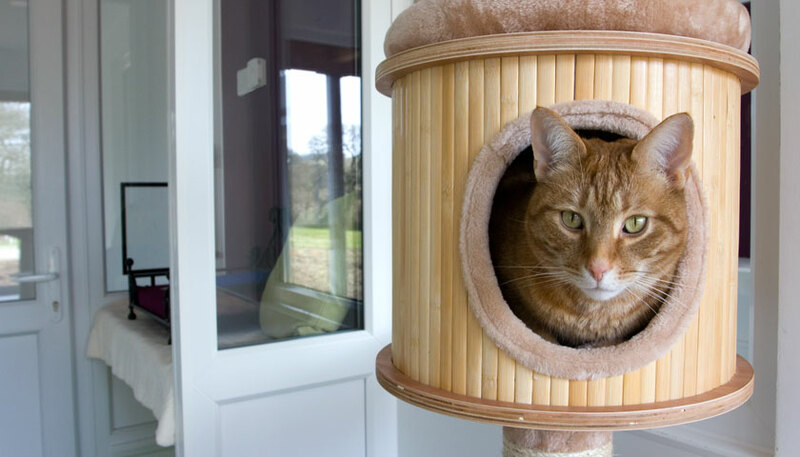 We offer puzzle feeders for our guests, encouraging them to 'hunt' for their food, and cat trees that provide vertical spaces for napping, as well as hideaways that provide comfort for more timid cats. 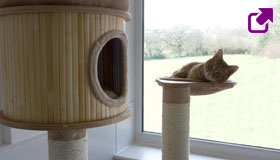 Scratching posts and mats are positioned in every room to encourage natural behaviour. 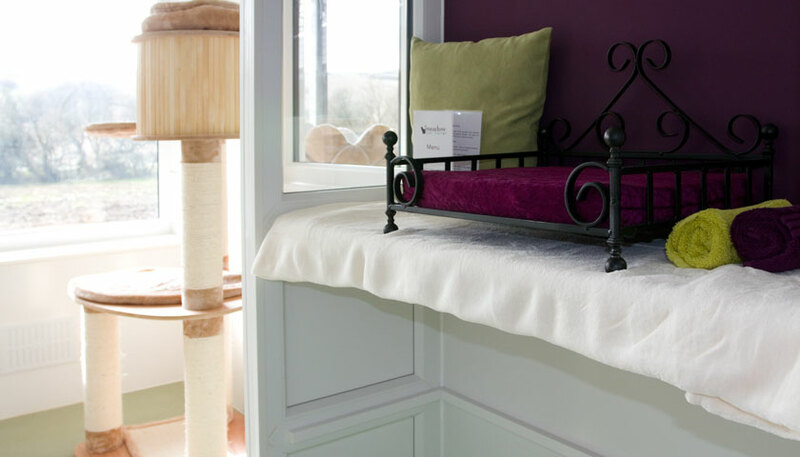 Our double rooms have adjoining doors allowing them to be combined to form a larger space for a family of up to 4 cats (or maybe an indulged single cat!). 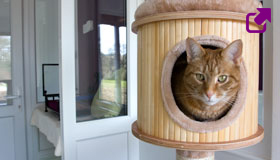 We also offer family rooms that are the largest of their kind and can host up to 4 cats of the same family in a single space.